This is a recent end grain cutting board that I made for a friend for Christmas. It has redheart on the edges which I really like. The checker pattern is white oak and walnut, the thins in the middle are yellowheart and padauk, the wood in the very center is a bit of a mystery. Some sort of very dense hardwood, but I’m not actually sure which one. Nicely done!! It will be appreciated for a long time. Oh, and prospector. I appreciate it. -- God, Family, Country, Woodshop! Thanks so much everyone! I really appreciate the encouragement. Actually looks like Zebra Wood….what’s the last picture all about? Oh, the person I made it for wanted to use a wood burner to personalize a message. I tried to take a picture of it, but it was kind of hard with my crappy camera. 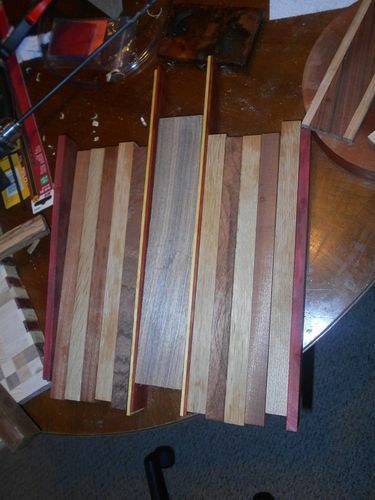 As for how I had all of the pieces cut to about 16” and glued them side to side at first. I’ll see if I still have a picture of that and attach it. Ah, looks like the only one I have is before I actually glued/clamped it together, but you get the idea. After planing that flat, I cut equal sections of about 1 3/4 inch and flipped them up on their side, turning every other one to make the checkered pattern. I clamped it just using bar clamps mostly if that is what you are asking about. I used several clamps to keep it from moving side to side and I ran a board across the top to keep them from floating up and down.